No more potato chips! 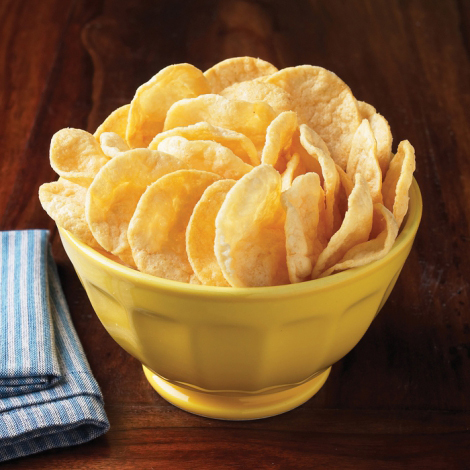 Bari Life Sea Salt & Vinegar Protein Chips are the smarter choice for a crunchy snack. You just have to try them to experience their perfectly salted and crunchy goodness! SKU: Chip 7 Pack-Sea Salt/Vinegar Categories: Protein Food, Chips Tags: Best Sellers, Ready to Enjoy! Bari Life Sea Salt & Vinegar Protein Chips are sold in increments of 7 bags. These Protein Chips have the crunch and flavor you need to satisfy your salt & vinegar craving without all of the calories, fat and cholesterol. This is an excellent choice for people who are trying to lose weight or maintain weight loss. The individual serving bags make it easy, so you don’t have to worry about eating too many chips because you can eat the whole bag! Potato (Potato Flakes, Rice Flour, Potato Starch, Salt), Soy (Low Fat Soy Flour, Rice Flour, Salt), Sea Salt and Vinegar Seasoning (Maltodextrin, Sea Salt, Vinegar, Citric Acid, Safflower Oil, Oligofructose Inulin, Supro Isolated Soy Protein), Mid Oleic Sunflower Oil. These chips are a great when you want something crunchy. The salt and vinegar tastes nothing like salt and vinegar chips but they are tasty. These chips were my favorite during my pre-op diet! They are a great source of protein and definitely help you get past that urge for something crunchy. The only reason I didn’t give it 5 stars is because you have to set your expectations before you eat them. They have their own unique taste and texture but they are not the same as an actual chip. Once you’ve accepted that they are a treat! These were really good. I found the flavor to be really tasty, though not quite as strong as some of the other flavors. These are Delicious and you should buy them. They are a great snack to have on the go!! I absolutely love these protein chips! Flavor is great and love the protein source! Loved these! Crunchy and a fair portion!